Today in Australia, it’s the race that stops a nation. The Melbourne Cup. It’s a huge horse race and having grown up about an hour out of Melbourne, we were raised on it. At school, come 3 o’clock, it was pencils down as we gathered around listening to the big race. Melbourne has a public holiday in it’s honour. It’s been won by some of the greatest race horses ever: Pharlap, Makybe Diva and back in 1861, one hundred years before I was born, the first winner, Archer. It is to Australian racing what Royal Ascot is to England and the Kentucky Derby to America. We even have a song about it, sung by the legendary Slim Dusty. My mum used to often dream about the winner though sometimes her interpretations were a bit skewiff. One year she dreamed of a rainbow coloured bird, enjoying a shower in the garden.. That year, Rainlover won the cup. She dreamed of the same bird the next year.. again Rainlover took home the coveted prize. Then another year she dreamed she was in a restaurant and was settling down to her meal, when a waiter came over and told her she had to move as Mr Big wanted to sit there.. Yes, that year, Think Big won the cup. The year after she died, I dreamed the night before the cup of a toddler, dressed in a pale blue and white jumpsuit. He was a naughty little kid but very cute. The next day, I chose the horse Rogan Josh because the jockey wore pale blue and white silks.. and yes, Rogan Josh led the pack to take the cup. I thought maybe she had passed the gift down to me after her passing. Like her, I’ve had a few wins and a few losses with only a few really obvious dreams.. Last night was one of those nights. I don’t ever look at the form guide beforehand, so I’m not influenced. In my dream last night, I was walking into a bottle shop at a hotel and I saw a robbery about to take place. The group were armed and went in, all guns blazing. I saw a barman go down and a women in the toilet cubicle next to me was taken out as well. Very horrible dream and VERY specific. So when I got up this morning and found that “Who shot the barman” was a contender, what was a girl to do, but put a few dollars on that particular horse, thinking Mum REALLY had my back and was watching out for me. I was quite smug. I went out to watch the race at a local wine bar called Leura Garage (highly recommended by the way) and even got Who Shot the Barman in the sweep there. I was set. Alas, when the 3 or so minutes of the running of the cup was over, Who Shot the Barman had come 11th.. The winner, The Prince of Penzance took the prize with the first ever female jockey to win the cup. To make it even more special, the strapper was a young man with Down Syndrome. How could I be disappointed by seeing such a good news story. I was so very proud to see another first for women in this country. What a fantastic outcome. Congratulations to all involved. You deserved it. I’m beginning to think my Mum must have a sense of humour and sent the dream to throw me off the scent and to keep her record intact lol. I guess it wasn’t an omen or a sign at all but there was much to smile about for the day. 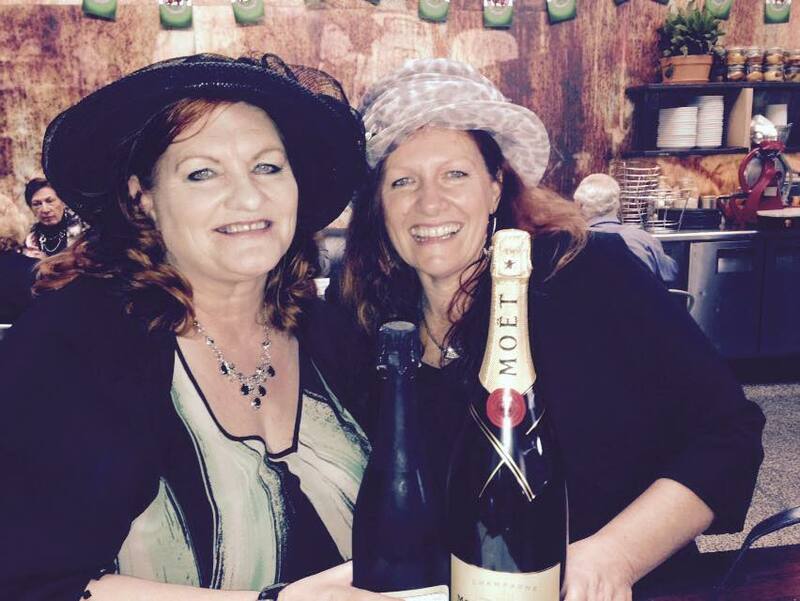 I went to the day with a friend who won a prize for answering a question (a bottle of bubbly) and then also took out the door prize and won a magnum of Moet and Chandon. Not a bad outcome there. Then we sat at a table which had a turnaround of a number of people who came in for lunch and left again. All chatted freely to us. We had a lovely young couple from Sydney but originally from France join us first, then two guys, one from England and one from Germany, just up on a tourist bus. They were happy to have a chat while they had a glass of wine. After them came a young couple from further out West in NSW. We laughed and chatted while they enjoyed lunch. Then finally, we met the lovely Janice from the blog, Benten Laughing, a fellow blogger like myself. I may not have won the money on the big race, but I had a huge win in the shape of a great day and it reminded me that I really do have to get out a lot more. Staying home all day in pyjamas and writing or doing art is fantastic, but getting out and meeting people is great for the soul. Thanks to everyone I met for making it such a great day. Thanks also to Leura Garage for putting the event on and to Trish for dragging me along.